The Chevy Bolt is the compact EV from Chevrolet that lots of buyers are looking forward to getting their hands on. The Bolt has a great long driving range, great interior space, and is well-priced. One of the items that prospective buyers might be wondering about is just how safe the small EV is. The IIHS performs crash testing on all vehicles sold in the US, and recently the 2017 Bolt went up for a full round of testing. Thanks to its performance in their battery of crash tests, Bolt earned an IIHS Top Safety Pick award for its performance. Check out video of the Bolt taking on the moderate overlap, side impact, and notoriously challenging small overlap IIHS crash tests below. It appears to do a great job minimizing impact on its passenger compartment. 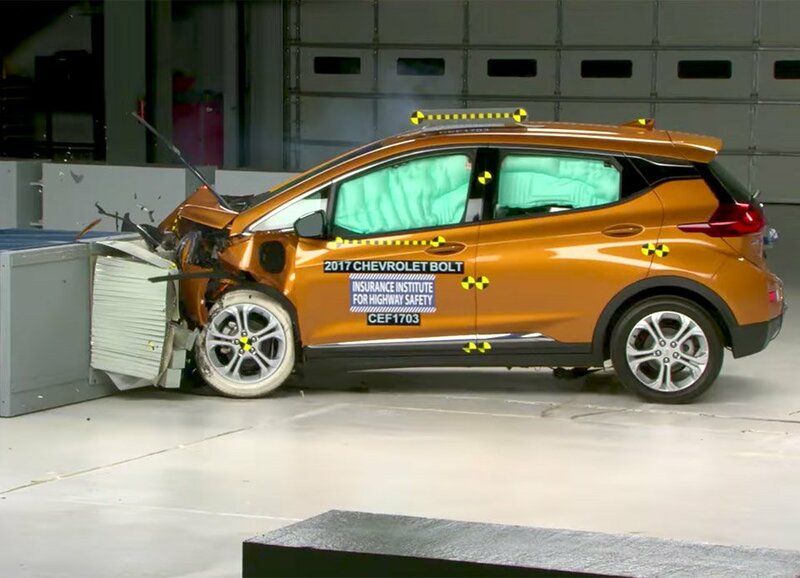 IIHS says that the Bolt earned good ratings in all five crashworthiness tests the organization performs. The only thing that kept the Bolt from earning the Top Safety Pick + designation was poorly rated headlights that can create glare for oncoming drivers.